Former England spinner James Tredwell has announced his retirement from cricket. 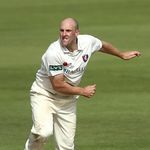 Kent and former England bowler James Tredwell announces retirement By Sky Sports News Last Updated: 17/09/18 6:57pm James Tredwell has announced his retirement from cricket Former England spinner James Tredwell has announced his retirement from cricket. The 36-year-old made his debut for Kent in 2000 but has not featured for the county this season after undergoing surgery on a shoulder problem earlier this summer. Tredwell has represented England in all three formats, playing two Tests, 45 one-day internationals and 17 T20s – with his last international appearance coming in 2015. “I feel very grateful to have been able to represent both my county and my country during my career,” said Tredwell, who confirmed his retirement on Monday.